I received a copy of The Falconer from Gollancz as part of their Gollancz Geeks project. I applied for this book mainly because the strange premise tickled my fancy. Who wouldn't be intrigued by a Jane-Austen-style heroine going out at night and hunting down monsters? In any case, did the premise live up to its promise of great things? 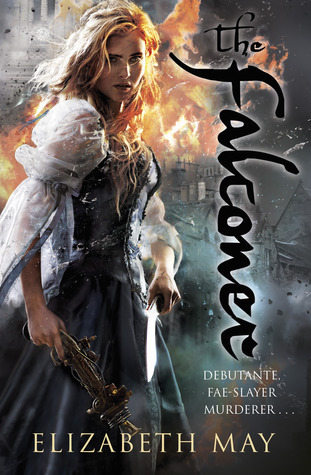 The Falconer follows Aileana Kameron, a debutante who spends her days carrying out a standard aristocratic life, attending balls, entertaining friends and the like; her nights are quite different, usually involving the murder of faeries. She must keep up a balance between propriety and murderous rage in order for both of her lives to carry on as expected. Or at least that's the plan. Since her mother's murder at the hands of a faery, she's been consumed by the need for revenge and a general homicidal feeling towards faeries as a species. Homicidal tendencies tend to somewhat muddle more mundane intentions, so her whole social life is a mess: society thinks that she killed her mother in cold blood and her frequent disappearances at balls is tipping her reputation closer and closer to total ruin. I'm not really sure whether I like The Falconer or not. On the one hand, it's a competently written debut novel, with a sympathetic protagonist, engaging side characters and a real feeling of threat and constant danger; all of that makes me tend towards liking a book. But on the other hand, there are two major flaws to the novel that stop me from actively liking it. First, there is the protagonist, Aileana, or Kam as she is just as often called. I know I said she was one of the good points, but hear me out. Aileana is sympathetic, there's no denying that. She's justifiably angry at the faeries for brutally murdering her mother in front of her, and the restriction she feels from her former debutante life is just as understandable and engaging. The problem that some may find with her though is that this makes her in no way likeable. At the beginning at least, there seems to be little to her character beyond bitterness and anger. She does develop a little more as the novel progresses, but by and large she is still defined by her reactions to events happening around her: she gets angry about the faeries that she comes across, she stews about the things that she has to do as her duty to society, occasionally feeling nostalgia for the person she used to be. There wasn't really much that I could point to and say "This is what makes her a character that I want to root for." I don't particularly want her to fail due to her sympathetic nature, but at the same time I finished the book more because I'm not feeling well and wanted something to distract me. The second major problem that I had with the novel was the ending. It doesn't so much end as stop, and rather abruptly at that. You know how most stories go: hero(ine) starts quest, it gets progressively more difficult until a final climactic struggle, at the end of which they either win the day for good or fail and emphasise the tragic futility of the whole endeavour. The Falconer doesn't do that. Instead, it gets to the final battle and stops right at the most tense moment. I cannot tell you how irritating that was. I'm not unfamiliar with cliffhangers at the end of books, most often when said book is part of a series. I guess I should have seen it coming, considering all the loose ends dangled invitingly in my face in the preceding chapters, but I sort of assumed that there would be some kind of quick resolution, or they would stay a mystery and create a sense of poetic tragedy. Nope. Instead, there's a clumsy grab for a sequel. It irritates me because I expected a complete story when I started reading, maybe not Aileana's only story, but something complete at least. It irritates me because there was no hint given that this would be the first in a series. It irritates me that so much was brought up towards the end, hinted at only to be snatched away by this forced ending. Most of all, it irritates me because it worked: I do want to find out what happens next, even though I'm angry at the book.